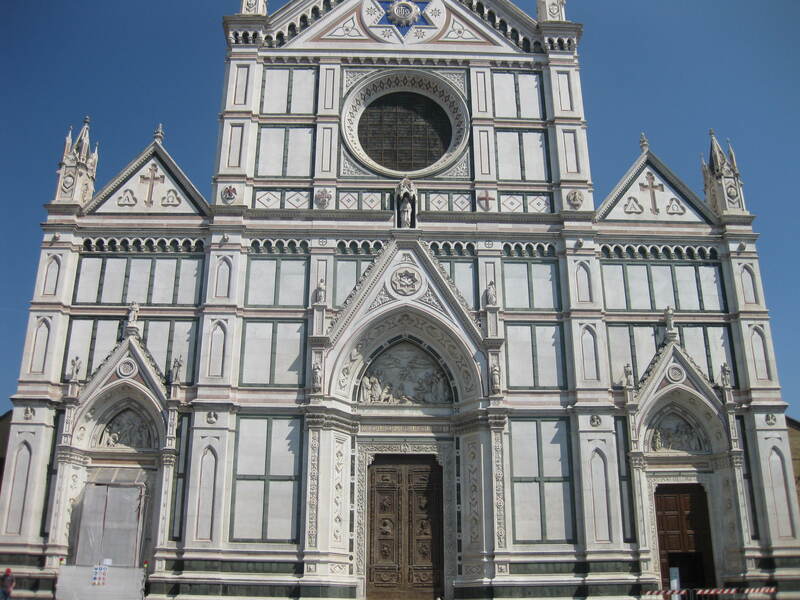 Heather’s European Discovery Tour – Unexpected Lessons and Surprises. I’m finding that being on a trip with 48 other people is causing me to pick up all sorts of new and interesting slangs! There are people from all around the world on our trip. Everywhere from New York to Georgia to Ontario to Korea to Australia to a guy from Saskatchewan! (He’s actually from Montreal but he’s currently living in Saskatchewan and that counts in my opinion). I’m really enjoying this cultural experiment even if it does mean that I’m picking up all sorts of random accents and phrases. Another thing I’ve noticed about Contiki is that random awesome things happen out of nowhere. The other night we had an epic sing along / dance party on the bus from Venice to Rome. It was all fun and games until one guy fell down the stairs, but he was fine so even then it was all good. I also participated in a gelato eating contest yesterday evening. I didn’t win but I was personally impressed with the speed that I ate that gelato in! There is always something new and fun waiting around the corner it seems. Two days ago we visited Venice and it was amazing. Probably a bit more crowded that I would prefer but still amazing. The views from the ferry during our ride in were excellent and the walking tour was great! I liked that the walking tour got us into parts of the city we would have never thought to go into otherwise. So many pigeons! The tour guide shared a fear of birds with me so we both had a few panic attacks but we survived so it’s all good. I was really astounded by all of the glass work in Venice! So amazing (I didn’t trust myself to buy anything. There’s no way it would make it home in my luggage – I’m far too rammy). A friend and I went up the tower, I think it was called the Campinile de St Marco. The views were absolutely amazing!!! Yesterday we arrived in Rome! between yesterday and today I’ve seen so much yet so little of Rome. This is the one downfall of a Contiki tour, you cannot possibly fit everything into the short times you have. It’s great to see so much of Europe in such a short time though. My favourite part was the Forum. Some friends and I spent quite a bit of time there today. I was really feeling ancient Rome at that moment, like I could feel the energy of it reaching out to me. I absolutely did not enjoy our tour of the Vatican. I think that the Vatican tour would be really good but unfortunately it was unreasonably busy (our Contiki guide Greg said this was the worst he’d ever seen it), It was really hard to enjoy the beauty of the art when there were thousands of people shoving you in every direction constantly. The art was amazing but I don’t think I would go back. I saw some outstanding works of art in the Castel Sant’Angelo earlier today without the ridiculous crowd. Lesson learned: Europe is CROWDED. It makes me really appreciate Saskatoon. I am not saying that I’m not loving Europe but that was more than what I was prepared for today. I DO recommend visiting the Castel Sant’Angelo if you have time. The building itself is really well preserved and there are some really neat artifacts and pieces of art stored there. The best thing though, is the view. If you go to the top level you can see so much of Rome. It was unreal! It is Africa hot here in Rome and the stairs were long and steep but the view was well worth it. One tip about Italy, which probably actually could work throughout the world, drivers do not really obey any logical rules. So if you want to cross the street, you just have to get daring enough, stick your arm out and up in the air and hope for the best. Other pedestrians will follow you and surprisingly, 70% of the traffic will stop for you; the other 30% will try to kill you but that’s all part of the adventure – right!?! Tomorrow is Florence so I should really get to sleep. I’m excited to go shopping to be honest. Some of the girls went shopping today and wow did they ever buy amazing stuff! Yay! Hey, well I’m finally back online after a few days of not having internet (or at least not wanting to pay for it). Well let’s gets back on track we went to Melaka for two nights…. The drive for KL to Melaka is about two hours where we stayed at the Holiday Inn Melaka which is right on the water; we could watch the tide come in and out every day which was pretty cool. The first day my tummy was not feeling good the night before we left KL we went to a fish farm and for a reflexology – the foot massage really worked! It did its job and made my bowels move a bit too much! This being said, I wasn’t feeling 100% our fist day in Melaka where we visited an elephant sanctuary, we got to see a lot of elephants and even got to ride on one of them. After that we had some free time back at the hotel and Amanda and I just went for a swim in the hotel’s pool. That night we went for supper at a hotel where the room we were supposed to be having dinner in (so we totally thought we were taken into the wrong room) was full of the Harley Davidson Singapore Owner’s Group, (we could tell by their shirts). Turns out this is where we were supposed to be but the bikers were on the last day of a seven-day rally. Their rally was to bring awareness to the issue of baby dumping in Malaysia. I guess this is becoming an epidemic as the lady at our table told us. We really have no idea why we were there other than there was a cultural dance group performing at the dinner. It was a weird way to end the night and a big eye opener to an important local issue. The next day we walked all around Melaka “the city of Museums for everything” they even have a stamp museum – anyway darn was it hot and humid. Just to put it into perspective for you it’s +30 with the humidity of +35 at 1236am….and then put that under the afternoon sun and well you are a walking puddle of sweat but I would rather have that than the snow. Melaka is actually a really nice city very casual and laid back. KL is very modern and business oriented with a large mix of all races. Langkowi also is very laid back but more conservative in nature, and has more original Malaysian culture, and Penang…well that was so long ago I can’t remember….it seemed to have more British history and beaches but that being said Malaka also had lots of history both British and Malaysian. Today we drove back to KL went to a nature park and walked through the forest where everyone got bitten alive by mosquitoes. Then we went to the Batue Caves…a natural cave with and Indian temple at the top of a steep 226 step staircase to the top; we then went up to the Petronas Twin Towers to see the view of the city. The towers are the second tallest in the world after the tower in Dubai. It is 86 stories high, it was really cool up there. Then we went back to china town to the market to do some shopping…I have lots of purses to choose from! So, our flights to Rome were pretty good…thank goodness for Aeroplan points. We had enough Aeroplan points to fly Business Class most of the way although we had to fly from Saskatoon to Vancouver first, then to Frankfurt and on to Rome…a little convoluted I agree but you do what you have to, to use the points. All was great except that our connecting time in Frankfurt was just too short even though we were 10 minutes early. It meant having to really hurry along the way (no German pretzels for Ed) and get one of the agents to help us jump the queue at the security line (and thanks to the couple that let us go before them) in order to make our flight to Rome. Even though it was a legal connection, I would recommend at least 75 minutes between flights. None the less, we made our connections and I must say that the service was exceptional on Lufthansa and the lay flat beds meant that we could get some much-needed sleep along the way. We booked our hotel in Civitavecchia rather than Rome as that is where the port for Rome is and we really had no time for sightseeing in Rome anyway. We booked the “Gold” package with a hotel called Hotel San Giorgio which included 1 night accommodation, transfers from Rome airport, dinner at their hotel, breakfast at their hotel and then transfers to the ship. The cost was 330 Euro (for both of us) which seems like a lot but when you include everything, was very affordable. Unfortunately, we were exhausted and completely missed breakfast. Civitavecchia, although just a port town, seemed like a very nice place and we wished we had more time to explore it. Getting on board the Regent Voyager was relatively painless although it is time-consuming registering and boarding about 650 passengers. The crew was very friendly and accommodating. Being a concierge host for a group means a number of duties getting ready for the cruise including sending out welcome letters, confirming where the cocktail reception is being held, confirming meeting room space for our pre-shore excursion and confirming where our office hours will be held, meeting the shore excursions manager, reception manager and food and beverage manager. But, with all that out-of-the-way, we were able to head out for dinner after a couple of stops to make specialty dining reservations for a couple of our group guests. The dining room has gone away from the pre-set dining times and now you can dine when you want. I don’t necessarily like that concept as with the set dinner times you meet and make friends with more people. None the less, the dinner was fantastic and we really like the all-inclusive nature of Regent cruise lines which means the wines at dinner were included as was the pre-retirement glass of port. I forgot to mention that Regent has a “block party” on the first night before dinner. That means you take your glass out into the hallway with you and they serve wine and cheese to everyone in your hallway. It’s meant for you to get to know your neighbours and we thought it was a great idea. Go figure, our one neighbour is from Edmonton of all places! Nice ice-breaker. 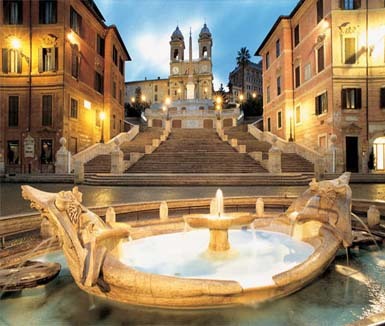 ROME – We have begun our Trafalgar Tour the 9 day “Italian Dream”. We found our Trafalgar rep at the airport right away to transfer us over to our hotel from Rome Airport. Great group with an awesome tour leader named Antonio! He has been so informative and I feel we can really relax as we tour around the sights. Our hotel, Carlo Magno Rome Hotel, is just a 15 minute cab ride from the center of Rome. Our first night included a visit to the Spanish Steps, Trevi Fountain and the Monument of Victor Emaneul II. Rome has a rich history with discoveries on each corner from thousands of years ago. Unfortunately, it’s very crowded, polluted and overrun with graffiti. It did not stop us from enjoying every minute of the scenery. Our second day included visits to the Colosseum, the Forum and the Parthenon. We are constantly warned to watch our belongings as Rome is notorious for pick pockets. We are getting accustomed to life on the bus and the early morning wake ups which are always worth it when you get to see what we have in the past couple days. Next stop… Venice! 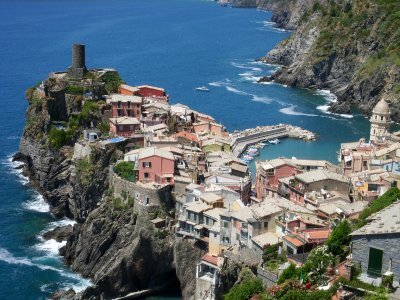 CINQUE TERRE – I’m in love with this beautiful place! Every corner is a picture perfect postcard and nothing but sunshine, smiles and wine to fill the time. It’s exactly what I was hoping for and it has proven to be a really relaxing getaway so far. We started our first day by hiking the trail from Monterosso to Vernazza. It’s not an easy trail as some areas are very steep and rocky. We somehow made it through after about an hour and a half. From there, we spent the day on the beach relaxing in the sun. Our hotel, Hotel Baia – in Monterosso, is steps from the beach and is around the corner from the train station. We love our beautiful oceanview room with balcony (180EUR per night). Day two, we started our day by taking a short hike between Riomaggiore and Manarola which was about a 20 minute walk through a paved path big enough for baby strollers. Manarola is popular for their sun bathing rock area which happens to have some great deep water swimming which was a blast. It will be sad to say goodbye as we change our pace again to join our Trafalgar Tour in Rome tomorrow… Ciao!